Well I’ve missed a day again. Thordamn. 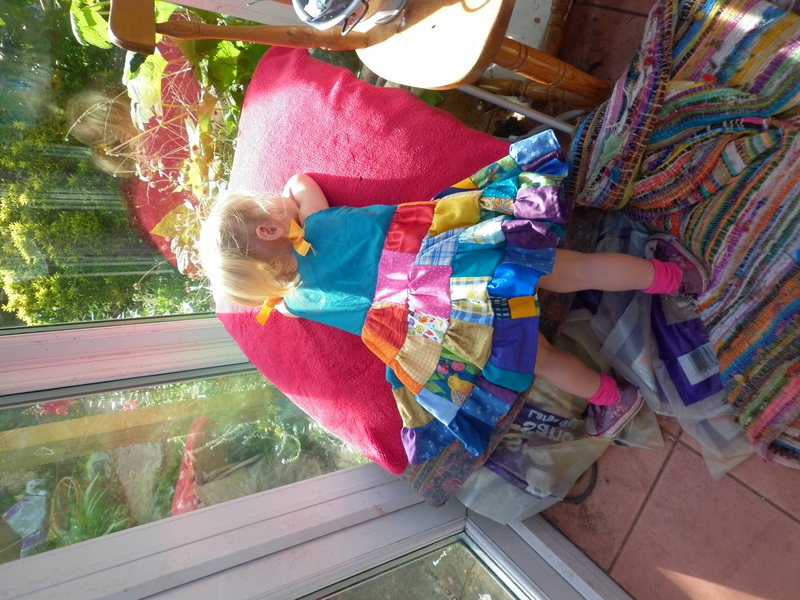 The thing is, I was seized with the urge to finish the patchwork dress for Ida to wear to the circus. I’m not sure whether these goals are good or bad. They do mean I, finally, get things actually finished but on the other hand I tend to get even more slapdash than usual. 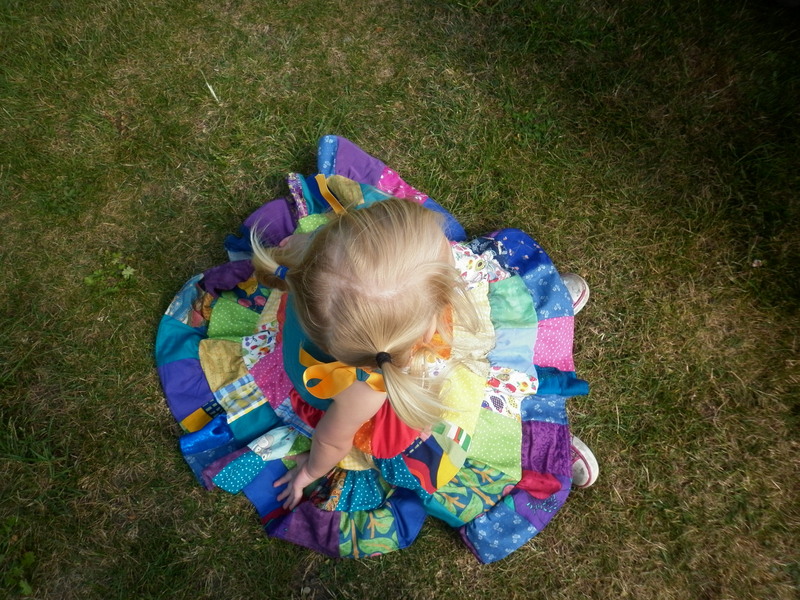 The dress was from this amazing tutorial Patchwork Twirler and is really a great example of a gorgeous dress. I cut out the squares the other Ida-free morning. 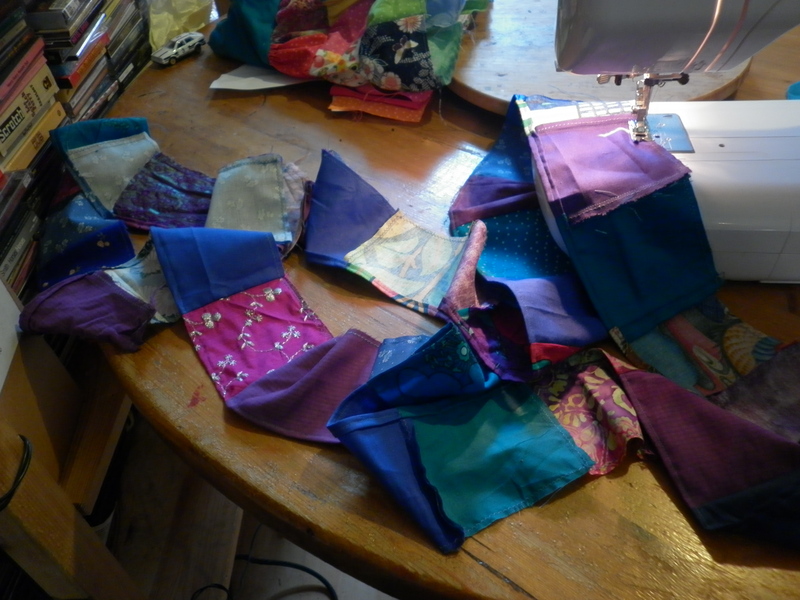 I even attempted to stop the fraying mayhem by zig zagging around every square. Took a while… I’ll let you know if it was effective after the first wash. I was aiming for a rainbow effect, starting with red at the top. I calculated the least layers I could get away with was probably four. Since I’ve never gathered before and have a disastrously short attention span I thought I’d stick with that. Well. I completely forgot about making a bodice/yoke thing. 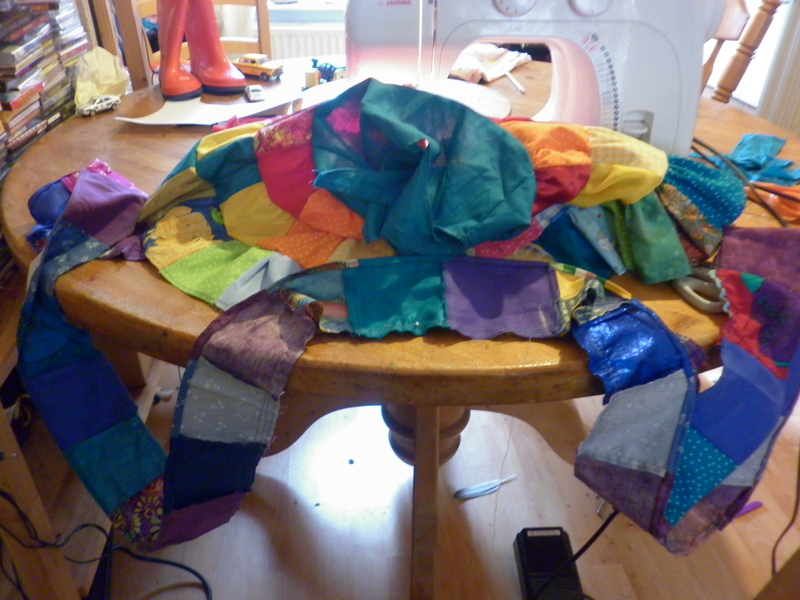 I hurriedly cut a rough shape out of some cotton and tacked it together. I planned to fit it better to her at the end. First mistake. Also the cotton I used was a bit thin. Next time I’d make it a bit more substantial. Look – it’s already bloody fraying and I haven’t even sewn it up yet. I’m still optimistic at this point. It’s my first gather and I haven’t realised I’ve sewn it to the bodice wrong. There is still hope in my heart. Yep, I’m cursing now. Loudly and colourfully. The kids and Steve are foraging in the kitchen for something to eat for tea. They can gnaw on cabbage stumps from the compost tub for all I care. I just painstakingly steered my increasingly uncooperative sewing machine around the previous flounce only to discover at the end it had run out of thread in the bobbin half way and in the flurry of material I didn’t even notice. Had to repin it all. Joined the rest of the foraging family in the kitchen briefly to check I didn’t miss any gin. Bacchus damn it – I didn’t. About halfway through sewing this layer on I had a little weep. Afloat on what seemed a neverending pile of pin- filled patches and realising I’d managed to catch a section of the previous layer. Steve’s put the kids to bed and I won’t be able to make the top fit properly on Ida AND I’ve promised her she’ll be able to wear it tomorrow. Gah. This is no fault of the tutorial. Just my technical ineptitude. 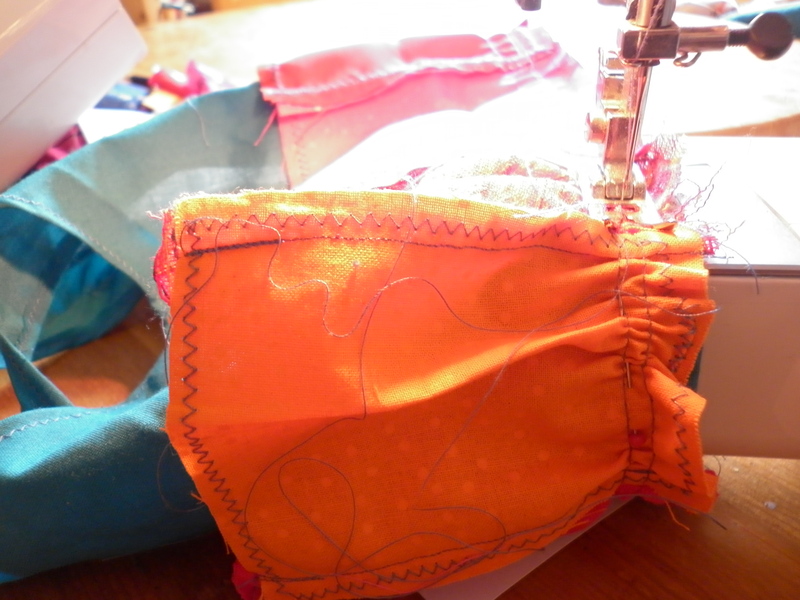 I think sewing is a good example of more haste less speed. Also I’m not very good at undoing and redoing. My natural inclination is to press on. 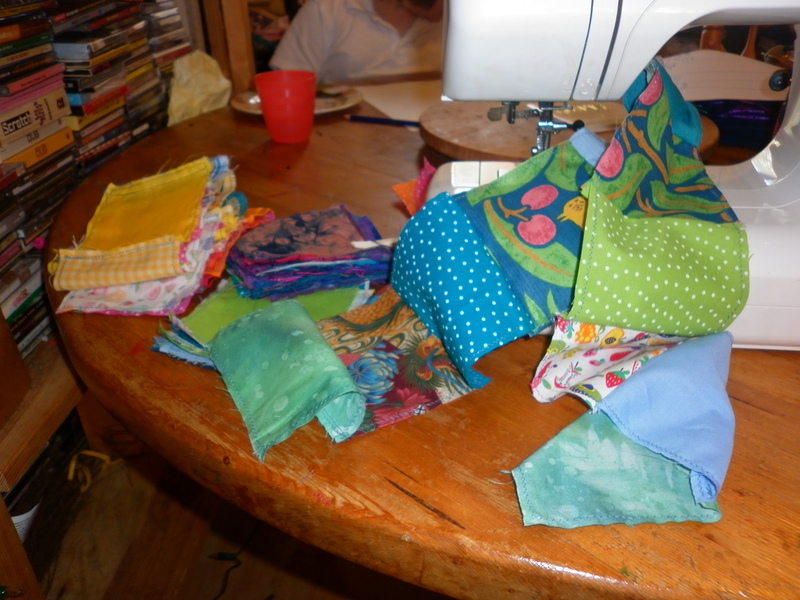 Mysteriously during my random piecing I’ve managed to make some of the patches line up. I was too lazy to un-pin and re-do so I’ve just let it happen. I’m hoping at the end it will not matter. The colours are so awful because it is late at night. I’ve still got to rig some ribbony straps. I do like it but all the faults seem glaringly obvious. I totally see what I’d do differently next time so it’s been a good learning curve. The question is whether Ida will like it in the morning. Ta da! – she does. It’s beams all round she spends a good half an hour spinning then crashing into stuff, dizzy. I realise I’m covering all her clothes in those button rosettes but I just can’t get enough of them. Really need to top up the button box though. The next photo is after a spinning induced collapse. There was a dreadful scene when we were trying to leave for the circus in the morning as Ida felt the pushchair straps were crushing her skirt. Bribery had to be used. The colours look so much nicer in the daylight. My mum raises her eyebrows at the wonky hem but is charmed by the way it lends itself to swirling. I love it, faults and all. I’m definitely planning another one, a more competently made one and can’t recommend the indietutes tute highly enough. 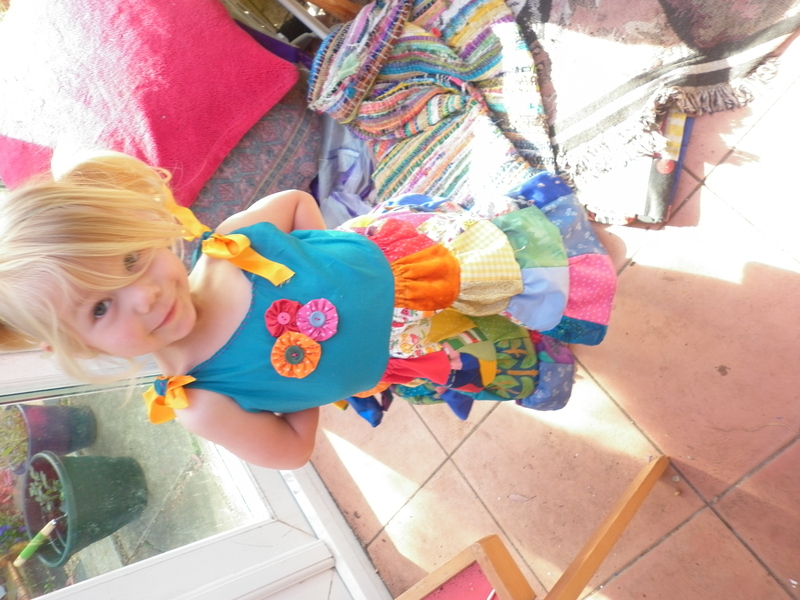 This entry was posted in Uncategorized and tagged Beautiful Things, children, crazy mum, equal deity opportunities, patchwork, sewing. Bookmark the permalink. It looks wonderful and Ida is the perfect model. The colours are wonderful. Thanks love – isn’t she just? how’s the knitting going? Laura, this is so lovely. I’m in awe of your skill and perseverence. 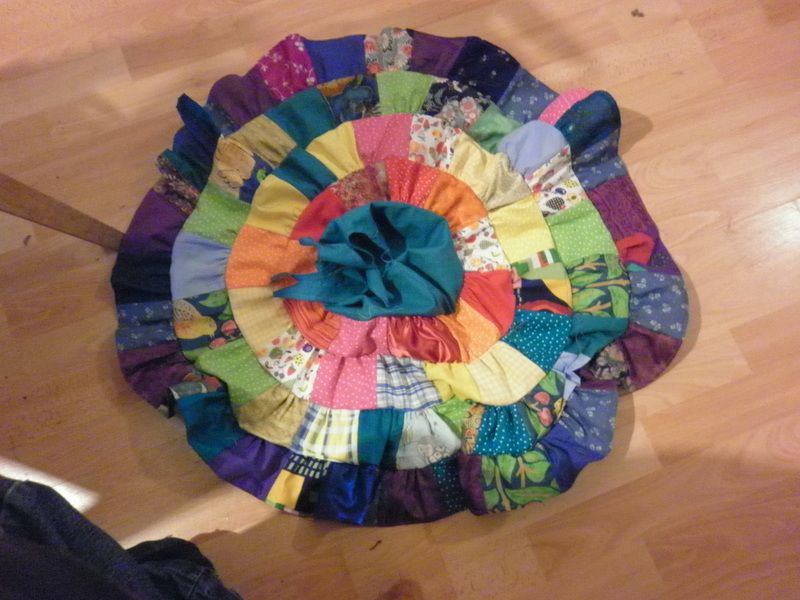 I was dreadful at sewing at school and have vivid memories of my sewing teacher making me unpick my circular machine embroidery about 10 times because it wasn’t good enough, so it’s put me off a bit. 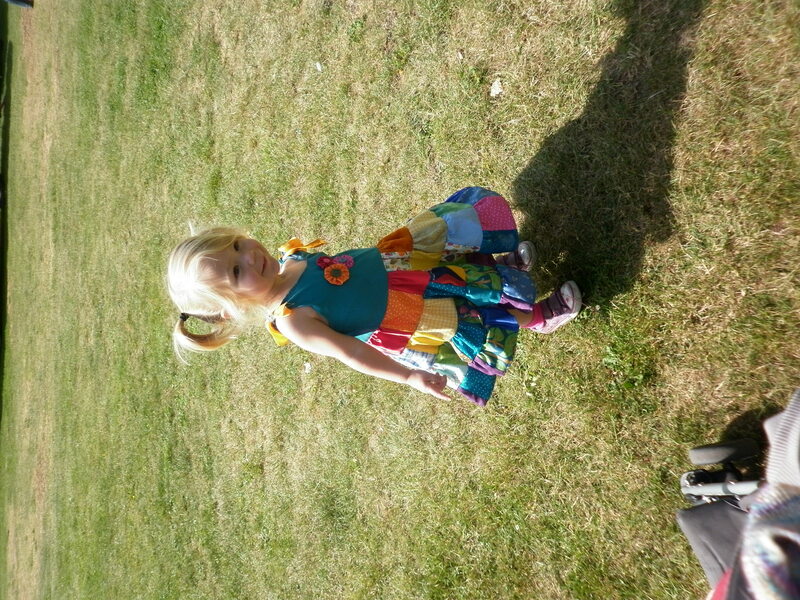 Ida’s dress is inspiring, such gorgeous colours. Isn’t it depressing how much that happens at school? Getting put off stuff. This is beautiful. I can readily identify with the tears and the gin hunt, but it all paid off. And the Gung-ho approach is not all that bad really, as I am discovering. You just need to love the imperfections and learn from the mistakes. Oh, and s l o w d o w n! Nothing can be perfect…it offends the Goddess. It’s absolutely wonderful. I have a fab pattern for a crochet dress if you’re interested? I have an eight-teen month granddaughter that I would love to attempt something like this for…I am gearing up to become a sewer!! 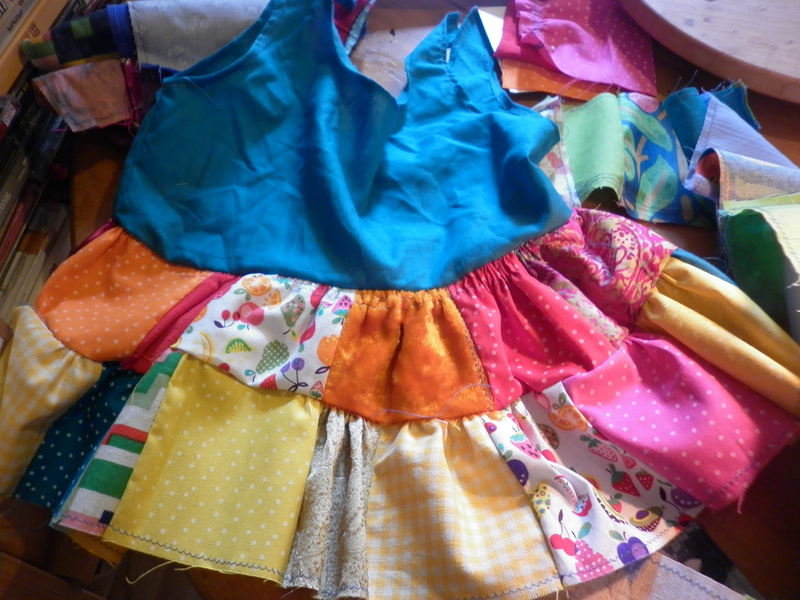 I sewed a couple of skirts way back in high school, as well as a few costumes for the kiddies. I am so inspired by all the creative folks out in this beautiful world, you being one of them. Lovely, bright and fun this gem of a dress. Thanks for sharing! 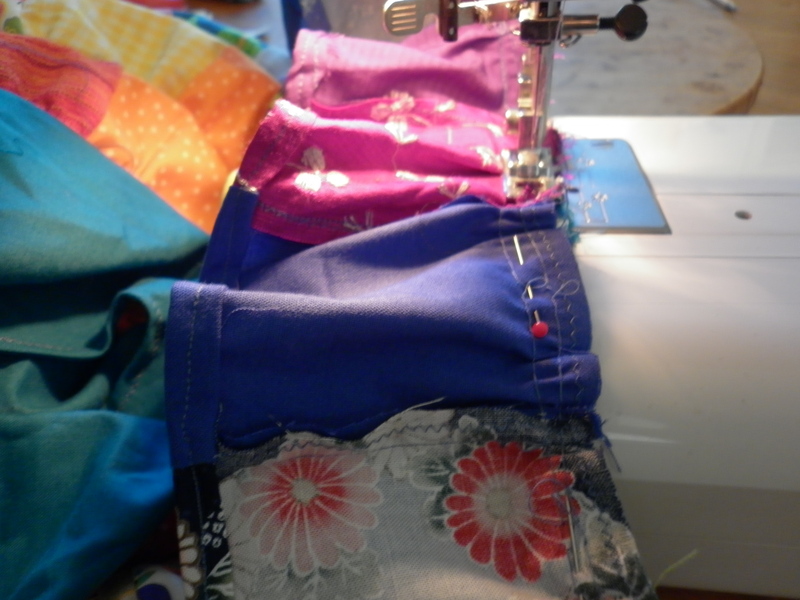 I know – I love looking at all the beautiful things on peoples blogs – sometimes I come away fizzing with new ideas. This dress came from the indietutes blog and if I (quite likely the most cack handed sewer in the world) can do it than anyone can. It’s just so beautiful, everytime Ida wears it my heart sings! It’s got a great swirling action as well. So far the zigzag edging of the squares has worked as it’s washing really well so it was worth it!